A family friend sent me this recipe years ago after my Mom raved about it. Since we're still enjoying salads during our heat wave in Texas, I thought I'd share it with you. It's so full of crunchy goodness!! Cut up the lettuce, chicken & onions & place in a bowl. Toast the almonds, Sesame & poppy seeds. Pour enough dressing over salad & mix. Sprinkle the almonds, Sesame & poppy seeds & Rice noodles on top. I also added some grape tomatoes to my salad. I think sliced strawberries would be delicious, too. Now, enjoy a bite of crunchy goodness!! I'm sharing this with Full Plate Thursday at Miz Helen's & Foodie Friday at Designs by Gollum. If you're looking forward almost instant gratification cinnamon rolls, you need to try this yummy recipe. I saw it awhile ago on www.joythebaker.com & she got it from http://bakingbites.com. I adapted it slightly & hope you give it a try! In a large bowl (I used my Kitchen Aid mixer), combine the flour, sugar & salt. Dissolve the yeast in a small bowl with 1 T. sugar & the warmed milk. Stir the milk mixture, oil, vanilla & egg into the flour mixture. Mix well, until very smooth. Let rest for 15 minutes. As the dough rests, mix the topping ingredients together in a small bowl until crumbly. Place pan into COLD oven, then set the temperature to 350 degrees. Bake for 20 minutes, until lightly browned & the center of the muffin springs back when lightly pressed. Cool for at least 30 minutes before mixing the icing together. Drizzle the icing onto the muffins. Now have yourself a delicious muffin. Leftovers can be frozen & reheated. I'm sharing this with Muffin Monday & Tea Party Tuesday & Pink Saturday. I wanted a quick meal for dinner & thought to whip up a frittata, which is really quite filling & a one-skillet meal. You can vary the ingredients on this to what you like. I happened to have some ham, baby dutch potatoes & Swiss cheese. I served it with Caprese Towers from Stonegable, which are such a beautiful addition to a meal! Here's the recipe for the frittata, slightly adapted from Cook's Illustrated. Adjust oven rack to upper-middle position, about 5 inches from heating element; heat broiler. Whisk eggs, milk, 1/4 teaspoon salt, and 1/8 teaspoon pepper in medium bowl until well combined, about 30 seconds. Set eggs aside. Heat about 2 t. olive oil in a 10-inch nonstick ovensafe skillet & brown the potatoes over medium heat until golden brown & tender, about 10 minutes. Stir Swiss, scallions, and ham into eggs; add egg mixture to skillet and cook, using spatula to stir and scrape bottom of skillet, until large curds form and spatula begins to leave wake but eggs are still very wet, about 1 minute. Shake skillet to distribute eggs evenly; cook without stirring for 30 seconds to let bottom set. Slide skillet under broiler and broil until frittata has risen and surface is puffed and spotty brown, 1 & 1/2 to 2 minutes. When cut into with a paring knife, eggs should be slightly wet and runny. Remove skillet from oven and let stand 5 minutes to finish cooking. Using spatula, loosen frittata from skillet and slide onto platter or cutting board. Cut into wedges and serve. NOTE: I covered the rubber handle of my non-stick skillet with a piece of heavy-duty aluminum foil to protect it from the heat under the broiler. I am sharing this with On the Menu Monday at Stonegable. We have a local grocery store that has give aways if you spend $20.00 or more. One week, they offered their Parmesan crusted chicken breasts. Naturally, I took home the free chicken & it was delicious! I asked them today how to make it & I duplicated it at home for dinner. My dear hubby has been undergoing chemo for almost a year now & the week after chemo, he loves to eat pasta. When I saw this recipe for Fresh Tomato Pasta with Herbed Breadcrumbs "Montreal" at Savoring Time in the Kitchen, I knew I would make it for him. I left off the breadcrumbs, but the pasta with fresh tomatoes was amazing! I had 3 skinless, boneless chicken breasts (Free!!) that I slathered with about 1/3 cup lite mayonnaise that had a few drops of hot sauce & 1 T. minced green onion (the grocery store used chives, but I didn't have any). Next, you sprinkle some dry Parmesan cheese on each side along with freshly grated Parmesan. That's it!!!! Now, put in a greased baking dish & into a preheated 375 degree oven. Bake for about 30 minutes or until no longer pink inside. The chicken is so moist & delicious. I hope you try this easy recipe along with the wonderful pasta dish. What a perfect, Summer meal! NOTE: For those who don't like mayo, try slathering butter on the chicken instead! I am sharing this with Full Plate Thursday at Miz Helen's & Foodie Friday at Designs by Gollum. It looks like a giant popover !! Adjust oven rack to middle position & heat oven to 450 degrees. Brush surface & sides of large skillet with oil. (I used a 10" stainless steel skillet). Place skillet on oven rack & heat until oil is shimmering, about 10 minutes. Combine flour, cornstarch, lemon zest & salt in large bowl. Whisk eggs in another bowl until frothy & light, about 1 minute. Whisk milk, butter & vanilla into eggs until incorporated. Whisk one-third of milk mixture into flour mixture until no lumps remain then slowly whisk in remaining milk mixture until smooth. Carefully pour batter into heated skillet & bake until edges of Dutch Baby are deep, golden brown & crisp, about 20 minutes. Remove to wire rack & sprinkle the Dutch Baby with the lemon juice & confectioners' sugar. Cut into wedges to serve. For an added treat, serve with an array of berries & sweetened whipped cream. NOTE: The Dutch Baby will deflate after it sits. It's supposed to! I am sharing this with Pink Saturday. Serves 4 M-m-m, the finished product! I cut this recipe out of a magazine YEARS ago. It's like the Magic Shell sauce that you buy, only BETTER!! It hardens on ice cream & is SO good. Of course, if you're making it for kids, you may want to leave out the nuts. Here's the recipe. Melt butter or margarine in heavy skillet over moderate heat. Add nuts & cook, stirring to prevent burning, until light golden brown. Remove from heat & stir in chocolate pieces until melted & smooth. Heat to serve over ice cream (sauce will crackle & become firm). To give, put in a jelly jar with instructions to heat the sauce before serving. Serve over my Vanilla Bean Ice Cream recipe for a scrumptious treat!!! NOTE: I re-heat the sauce in the microwave on medium power until melted. Recently my grandsons wanted to make "that vanilla ice cream", so when they came over we whipped some up. This recipe is so easy & they just love it! I am sharing this with Tea Party Tuesday at Sweetology. In a saucepan over medium low heat, combine all ingredients, except vanilla bean. Stir occasionally until sugar dissolves. Cool slightly. With a small knife, scrape tiny black seeds from bean into cream. Discard bean. Chill thoroughly. Follow directions for your ice cream maker. NOTE: In place of vanilla bean, substitute 1 T. vanilla. The name of this Rachel Ray soup is actually, are you ready?... Why-the-Chicken-Crossed-the-Road Santa Fe-Tastic Tortilla Soup!!!! I have never been to Santa Fe, but I thought my tastebuds would like to make the trip. The trip was well worth it if you love spicy soups!! This recipe was rated #28 in Rachel's Top 100. This soup is not exactly a "30 Minute Meal", as it took me closer to an hour with all the chopping, grilling, etc. I am particpating in the Celebrity Chef Cook Along at Happier than a Pig in Mud. Go there & check out all the other great Rachel Ray recipes. Heat a grill pan to high and a soup pot to medium high. Drizzle oil on corn and place on grill. Add red pepper to grill with corn. Char vegetables 10 minutes, total, turning occasionally. Remove to cool, 5 minutes. Remove charred skin from the pepper. (I did all this on my gas grill). While vegetables cook, dice chicken. Add 2 tablespoons oil to hot soup pot. Add chicken to pot. Season with poultry seasoning, cumin, salt and pepper. Lightly brown chicken on each side. Add zucchini, onions and garlic and chipotle peppers. Cook vegetables with chicken 5 to 7 minutes to soften. Add tomatoes, tomato sauce and stock. Bring soup to a bubble, reduce heat to medium low. Scrape corn off cob and add to soup. Chop grilled red pepper and stir into soup. Add chips to soup in handfuls and fold in. Serve soup immediately with scatter of shredded cheese and a dollop of sour cream. Top with any or all of the suggested garnishes. As a side note: You can freeze the leftover chipotles by placing individual ones on wax paper, placing on a tray, freeze until firm & then place in freezer proof bag. I saw a recipe for this in our local newspaper, but I've adapted it to be grilled & changed it so much, that now it's a new version. This makes for a beautiful, colorful presentation. 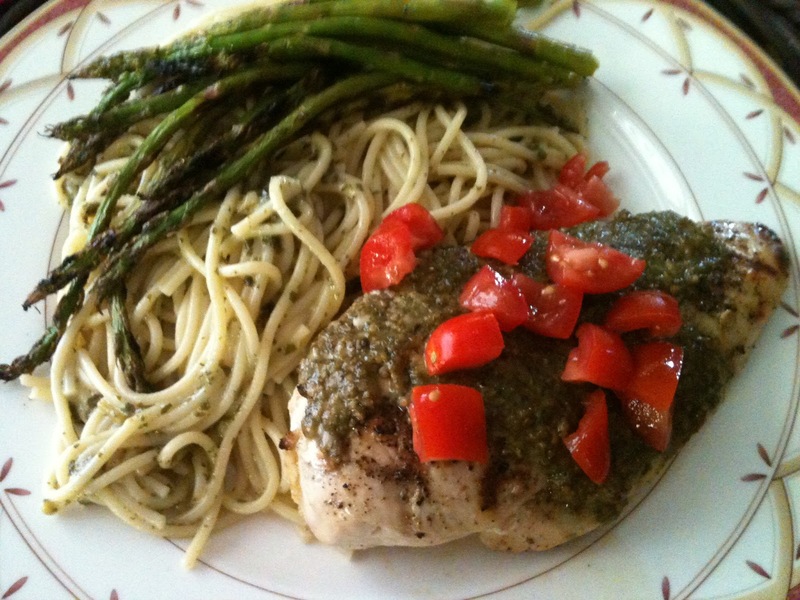 If you like pesto, or make your own, this one's for you! You can double or triple this recipe & freeze the leftover in ice cube trays. That way you can pop them out when frozen & store them in a freezer proof bag & have pesto when you need it. Put all in a blender or food processor & blend or pulse until smooth. If needed, add a little more oil to make it spreadable. Place the chicken breasts in a glass dish & pour the Italian dressing & lemon juice on top. Cover & marinate, refrigerated up to 3 hours. Remove the breasts from the dish, pat dry & season with salt & pepper. Discard the marinade. Heat your grill to medium-high. Sear the breasts for 2 minutes, turn a quarter-turn, on same side & grill 2 minutes more. Now, flip the breasts over & spread the pesto on top of each breast. Repeat the searing. If your breasts are very thick, you may need to put them on the part of your grill where you can turn down the burners. Cook until no longer pick in the center. NOTE: While the chicken was cooking, I also grilled my asparagus. Remove the chicken & asparagus to a platter, add chicken broth & let rest for 5 minutes. Using the remainder of the pesto, toss your brown rice or pasta with it. You may need to add a little more olive oil or chicken broth. Arrange the chicken on each plate, drizzle with the pan juices & garnish with the tomato. Divide the rice or pasta on each plate & top with the asparagus spears. I am sharing this with Foodie Friday & On the Menu Monday & Full Plate Thursday . We love meatballs subs & I'm not opposed to buying frozen meatballs for a quick & easy meal. This can be thrown in the crock pot & you'll have a great meal when you come home. In a medium saucepan, heat oil over medium heat. Add onion & saute until translucent. Add garlic & crushed red peppers & cook about 30 seconds. Add tomatoes & seasonings. Bring to a boil & then simmer. Add this point, I put it in a crock pot & throw in the frozen meatballs & cook on low all day. Cut the bread into portion sizes & split them horizontally. You can lightly toast them, if desired. Sprinkle with mozzarella cheese & then fill the bread with enough meatballs & sauce. These are very messy & you may need a fork for eating! I sprinkled fresh basil on top...Yum!!! I am sharing this with Full Plate Thursday at Miz Helen's. Sprinkle yeast over warm milk (like a baby's bath water); let stand until yeast dissolves and starts to expand, about 5 minutes; whisk in butter. Turn dough onto a lightly floured surface to form a smooth ball; place into a vegetable cooking spray-coated large bowl and then cover with plastic wrap. Place in a warm place until dough doubles, 1 1/2 to 3 hours, depending on room temperature. Mix remaining 1/4 cup of sugar with remaining 2 teaspoons of cinnamon and flour. Set aside. Turn dough onto a lightly floured work surface, stretching it into a 20-by 9-inch rectangle; brush with egg and sprinkle with cinnamon sugar. With the 9-inch side facing you, roll dough into a tight cylinder & place seam side down in a vegetable cooking spray-coated 9-inch loaf pan. Cover pan with a damp towel; let rise until almost doubled in size, 1 hour to 1 1/2 hours, depending on room temperature. Ten to 15 minutes before baking, heat oven to 350 degrees. Brush dough with remaining egg wash and bake until crust is brown and interior registers 190 degrees, about 45 minutes. Turn loaf onto a wire rack to cool. (Cooled loaf can be wrapped in plastic wrap and stored at room temperature a day or two or wrapped loaf can be placed in a zipper-lock bag and frozen up to 1 month.) Slice, toast, serve. Years ago, when my daughter was in high school, one of her girlfriend's gave me her family's salsa recipe. It's the only one I've ever used since. It's really quick & easy & my hubby's favorite. I hope you give it a try! Chop the first 4 ingredients in a food processor. Add the rest of the ingredients & pulse until it's the consistency that you like. Serve with your favorite chips. I like to mix some of this salsa with some sour cream & use it as a dressing over taco salad. After reading an article from http://www.realage.com/ & discovering that we all need to eat more beans to reduce the amount of belly fat, I tried this delicious meal. It's also a cool & refreshing Summertime meal. I hope you try it! Shred or chop chicken & combine with black beans, tomatoes & corn in a salad bowl. Heat oil in a small skillet over medium heat. Add garlic & saute until just beginning to color, about 30 seconds. Add oregano & cumin; stir until fragrant, about 10 seconds. Remove from heat; add vinegar & salt. Pour over the salad. Add scallions & parsley; gently toss to combine. Note: Next time I will add a minced jalapeno. I also think some cooked brown rice or barley would be a good substitute for the corn.